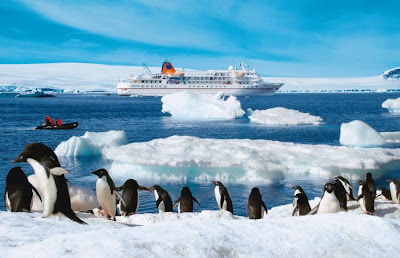 he International Maritime Organization adopted a ban on the use and carriage of heavy fuel oil for ships sailing in Antarctica this month, effectively meaning that beginning August 1, 2011 most large cruise ships will no longer be able to sail in Antarctica. Hapag-Lloyd Cruises’ two expedition ships, the 5-star* MS HANSEATIC and the 4-star* MS BREMEN have always used diesel fuel, state-of-the-art waste disposal systems (rubbish-incinerator and biological sewage treatment plant on board) and environmentally-friendly underwater paints (TBT-free), which will allow both ships to continue this very popular route in 2011 and beyond. Hapag-Lloyd Cruises’ expedition ships carry no more than 184 passengers. Zodiac (small motorized boats) landings, under the guidance of experienced experts who give detailed instructions to passengers about proper conduct while in Antarctica, never exceed 20 people. For more information on other HANSEATIC AND BREMEN international cruises, visit www.hl-cruises.com.